From March 14th to 18th, 2016 the trade fair CeBIT will attract many IT experts and professionals to Hannover. 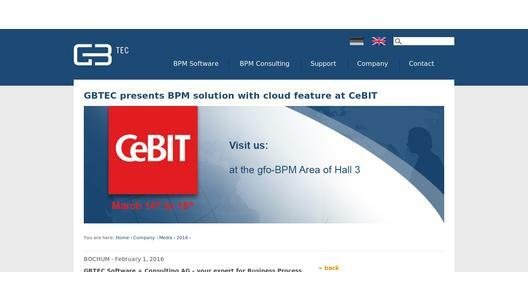 GBTEC will present their latest Business Process Management (BPM) solutions at this year’s fair including new cloud features. GBTEC’s BPM is a full service - award winning - IT solution that covers all relevant functionality to optimize business and IT processes including modelling, visualising, analysing, monitoring, and executing. The recent BPM suite BIC is an information platform for process and IT management meeting the latest requirements of the digital world. It encompasses operational features as well as integrated process management functions. 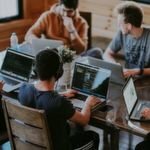 Using the BIC platform in combination with Internal Control System, Enterprise Architecture Management, Enterprise Content Management, real-time analyses, will allow the user to efficiently address a variety tasks. Focusing on the assistance of integral transformation, the new BIC platform sets the benchmark, from strategy to operational implementation. Find out more about the innovative suite BIC during this year’s trade show and visit GBTEC at the gfo-BPM Area of hall 3. Representatives of GBTEC will provide you with all the information you need about individual consulting services from GBTEC.